If you are a fan of a team, you’re always aware of your team’s games. But, sometimes, if you are wholly invested in one team, you tend to miss what out on what is going on around the rest of the league. Last season, I wrote a similar article concerning the other teams Thunder fans should be looking out for as that season closed (namely the San Antonio Spurs and Toronto Raptors). In a vacuum, a fan should only be worried about their team. But, in reality, with playoff positioning and/or draft positioning at stake, watching how other teams perform at the end of the season can add some drama to a point in the season where drama is sometimes lacking. This season, there are 5 teams Thunder fans needs to be paying attention to than can affect their near future. Why it matters: The No. 1 seed in the Western Conference (and in the league) is at stake. Team’s outlook: Currently 59-16 (1st in West), with 4 road games and 3 home games remaining. This is very reminiscent to what happened last season. This time though, it seems like the Spurs are far enough ahead to not have to worry about the Thunder chasing down the No. 1 seed from behind. The Spurs are currently on a roll, coming into the Thunder game having won 19 in a row, and hold a 4 game lead over the Thunder. 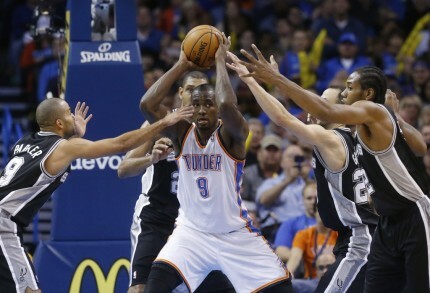 With their penchant to rest starters late in the season, the Thunder still have a slight chance to catch the Spurs. But it seems like a foregone conclusion that the Spurs will head into the playoffs with the No. 1 seed in the West. One thing to remember is that if San Antonio does stumble, the Thunder own the tie-breaker over them. Why it matters: The Thunder own the Mavericks’ first round pick if it is outside the Top 20. The Thunder got this draft pick in the Harden deal from Houston. There are two factions when it comes to this pick. Those that want the pick this season (slotted to be in the 21-23 range) and those that want the pick to go all the way until 2018, when it becomes unprotected. It will all depend on if Dallas make the playoffs or not. If they make the playoffs, they’ll be one of the top 10 teams in the league, thus garnering a pick in the 21-30 range, which transfers over to the Thunder. If they don’t make the playoffs, the Mavericks will pick in the lottery and will keep the pick. The Mavericks are battling with the Memphis Grizzlies and the Phoenix Suns for the last two seeds in the Western Conference playoff race. Of the remaining games between the 3 teams, the Mavericks face the harder road with their opponents having a .525 winning percentage combined. But the road will not be easy for either one of the 3 teams because, NEWSFLASH!, they all play in the Western Conference. That being said, the Mavericks had their opportunity to put some distance between themselves and the other two teams, but flubbed an 8 game home stand to the tune of going 4-4. Luckily, all three teams play each other in the final week of the season. I’m torn as to what I want to do with this pick. Part of me thinks that Thunder GM Sam Presti, with two draft picks late in the first round, could package those to move up a couple slots and get a shooter like Nik Stauskas of Michigan. But part of me also wants to see what happens if this pick actually reaches 2018 unprotected. Unless Dirk Nowitzki goes on Tim Duncan’s offseason training program, I see his effectiveness, and that of the Mavs, steadily going down in these next couple of seasons. And hopefully, they completely bottom out in the 2017-18 season. Teams’ Outlooks – With a virtual tie for the Eastern Conference top spot, these two teams meet one last time on April 11th. 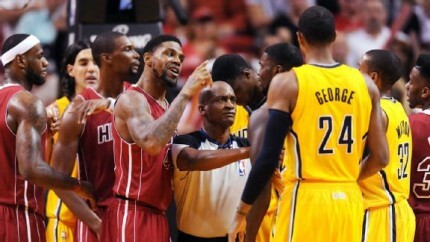 Indiana currently leads the season series 2-1. With a 2.5 game lead over these two teams in the league standings, the Thunder are in control to maintain home court advantage against any of the East’s top teams if they meet in the NBA Finals. The major issue here is whether the Pacers will give Miami a run for their money and make the Eastern Conference Finals somewhat competitive. While Miami has been surging in the last 10 games, going 7-3, the Pacers have been doing the exact opposite, going 7-10 in their last 17 games. The jump from being a good team to becoming an elite team is the hardest jump to make in the NBA. Not only do you have to start positioning your role players correctly, but your star players have to start taking that next step. For Indiana, a combination of questionable in-season moves and lack of player progression has slightly slowed that progression from good team to elite team. The mid-season trade that sent Danny Granger to the Philadelphia 76ers for Evan Turner and Lavoy Allen has yet to bear fruit. And the mid-season signing of Andrew Bynum can probably be deemed a failure due to a reoccurrence of knee issues for the center. In addition, Paul George and Roy Hibbert have failed to significantly improve from where they were in the beginning of the season. With this recent slide, rumors of infighting and selfishness have begun to sneak into the vernacular that describes the Pacers. The mental aspect of making the jump from a good team to an elite team is the hardest thing for a young team to grasp, and its currently showing with these Pacers. 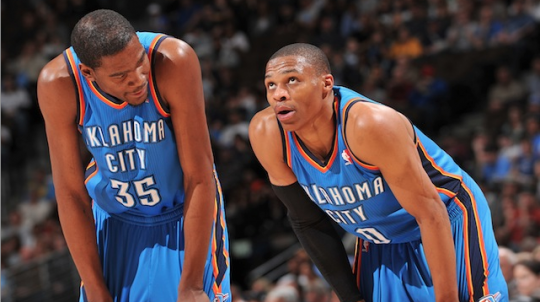 The reason this matters to the Thunder is because the Western Conference playoffs are going to be a gauntlet. The first round match-ups will be formidable and the series will only get tougher from there. If Miami is able to skip through the East playoffs easily, and get some rest in the process, that could spell trouble for the team that comes out of the West, regardless of who it is. Team’s Outlook – Currently 33-43 (8th in the East), with 3 road and 3 home games remaining. Looking towards the future at division rivals, the team that has the best chance of getting better quickly is the Denver Nuggets. The Nuggets suffered a myriad of injuries this season that prevented them from ever making a run at the playoffs. But with many of those players coming back next season and a potential lottery pick, the Nuggets are in position to get back to their winning ways. If the Knicks make the playoffs, their pick moves down to the No. 15 slot. But if the Knicks miss the playoffs, Denver will be slotted to pick in the 7-9 range, while also having the potential of getting a top 3 pick. Seeding doesn’t seem to affect the Thunder that much. They know they can beat the Spurs in San Antonio, if necessary. Their main goals to finish this season are to stay ahead of the LA Clippers, Miami Heat, and Indiana Pacers, and to get/remain healthy. As the season rolls to a close, it’ll be interesting to keep a vested interest in these 5 teams, as their outcomes all have the potential of affecting the Thunder in the near future.